I have to admit I've been keeping a little secret from you, my readers, about 12 year old Retriever mix, Xena. You'll understand if my reasoning was primarily to keep my material upbeat and educational. Today's post is definitely educational, so I'll let this canine cat out of the bag. A year ago, when I took Xena into the vet for her annual vaccinations, they opted to run some screening blood work, because of her age. They explained that some vaccinations are tougher on an older dog's system, and can be considered optional after age 10 or so. The tests turned up an irregularity in her liver enzymes which was cause for further investigation. We learned that Xena had a good sized, pre-cancerous tumor inside her liver, pressing on her hepatic artery. After tests, exams and opinions from 3 vet practices, we determined that her chances of surviving the surgery to remove the tumor were less than our comfort level, given that she was currently enjoying an incredible quality of life for a dog 11 1/2 years old. The risks of her age coupled with the location of the tumor, clearly increased the possibility that she could bleed to death in surgery. Rehab from the surgery would have been highly challenging, with physical therapy, possible radiation therapy, and the daily rigors of carrying a 50 lb. dog outside for nature's call, while her abdomen was stitched and her back legs weakened. After considering all of these possibilities we opted to allow Xena to continue with her currently excellent quality of life for as long as she was pain-free and able to get around on her own. While her prognosis was not sunny, the doctors each felt she would at least enjoy several months of continued comfort. Little did we know that we had given her the gift of a normal life span for a Retriever. Check out that Gray Muzzle! In case you are wondering, Xena is 1/2 Golden Retriever and 1/2 Labrador Retriever/Chow Chow. 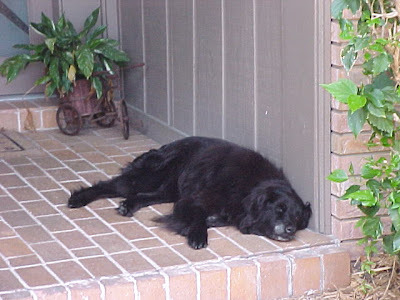 As a younger dog, she was often confused for a Flat Coated Retriever. Age has thinned and shortened her fur, as well as dulling her coat, but nothing has yet diminished her spirit. The doctors gave us a brief list of symptoms to watch for and one suggested a holistic liver aid called Milk Thistle, which has been shown to assist the liver's functioning. In addition to this supplement, I switched Xena to organic dog food, thereby eliminating toxins, food colorings, flavorings and preservatives from requiring processing in the liver. All these changes clearly took the stress off of Xena's liver, as she has just marked the one year anniversary since that diagnosis, and is still symptom-free. She continues her regular brisk walks, enjoys frisky wrestling matches with Tanner and loves to bask in the cool Spring breezes on our front porch, while dreaming the afternoons away. Isn't that what retirement is all about? We could not have asked for more. An additional year with our sweet girl remaining healthy, active and playful is more than we dreamed of. Although we know her time is coming, we now are assured that we made the right decision. We can see in her eyes the happiness of greeting each day with continued vigor. While Xena continues to visit the dog park, play with her housemates, enjoy our pool, and take her walks, I feel better each day that she and I are healing together. Yes, I said together. My own battle with cancer has also been met with an organic punch. Next month will be 2 years since my diagnosis, and I, too, am still cancer free. If you or a loved one are interested in learning more about why eating organic is good for preventing and treating cancer, I invite you to join me on my journey at my other blog, Organic Journey Online, where I write about all things green and organic. I also urge you to read the Hundred Year Lie, by Randall Fitzgerald, a well-known investigative journalist. This book will open your eyes to the many poisons we are stressing our lives and our Earth with, and could leave you asking, "Why do I eat this Big Mac?" It's the best ten bucks you'll ever spend on your health, or your dog's.